Background: To provide quality care to the patient's perspective and patient satisfaction are two major multidimensional concepts. In India, patient satisfaction with dental services has received only minor attention as the importance of the teeth is always neglected. Objective: To assess the satisfaction level among patients toward dental treatment rendered at an academic institution. Materials and Methods: A cross-sectional study was conducted among 474 voluntary camp patients visiting Department of Public Health Dentistry, Swami Devi Dyal Hospital and Dental College, Barwala, using a 14-item closed ended questionnaire which included demographic details, attitude, and practices of the participants and their satisfaction level to the treatment rendered to them was graded as highly satisfied, satisfied, and not satisfied. The data were analyzed using SPSS version 18 which covered both descriptive and inferential statistics. Results: Curative and preventive treatment was mostly required in younger age groups whereas extraction and prosthetic rehabilitation were found to be present in older age groups. Lack of education and awareness was the most common reason behind not seeking treatment. Majority of the participants were satisfied with the treatment rendered and were found to be statistically significant with visiting and referrals (P < 0.01). Conclusion: Imparting proper and appropriate information regarding the dental treatment will definitely change the attitude of the patients, thus help in raising the satisfaction levels. Oral health is considered cardinal to general health and well-being. While the eyes may be a window to the soul, our mouth is a window to our body's health. A healthy mouth enables an individual to speak, eat, and socialize without experiencing any active disease, discomfort, and embarrassment. Oral cavity is associated with the development of healthy personality, perception, and overall experience of pleasure. Hence, when the oral health of the patient is altered, it is the responsibility of the dental health provider to restore the oral health of the patient to the better level to satisfy those. Quality care depends on two major multidimensional concepts which include patient perspective and satisfaction. Quality of care has a subjective profile as it involves cognitive evaluation process or a structural measure whereas patient satisfaction tends to have an objective profile and determinant, which is patients' own perception. Kotler defined satisfaction as “A person's feeling of pleasure or disappointment resulting from comparing a product's perceived performance or outcome, in relation to his or her expectations.” Satisfaction involves intellectual, emotional, psychological factor, previous experience, and expectation of the patient. The aim of this study was to identify the attitudes, constraints, treatment to be rendered, and their satisfaction regarding the dental treatment rendered among the camp patients visiting a dental college in Barwala, Haryana, India. A cross-sectional study was conducted among 474 voluntary camp patients visiting over a period of 3 months (August, September, and October 2015), Department of Public Health Dentistry. The study protocol was approved by the institutional ethical and review board before the commencement of the study, the content of the questionnaire was made by the panel of experts in the Department, and a pilot study was conducted among 50 patients seeking treatment to check the feasibility and operational efficiency. Few modifications were made in the final questionnaire based on the responses given by the participants. A 14-item closed ended questionnaire was used to assess the patient's perception regarding knowledge, attitude toward oral health problems, their treatment, and satisfaction level with the quality of treatment provided. Emergency treatment was given in the mobile dental van. The treatment rendered in the dental college Department of Public Health Dentistry was scaling, extractions, root canal treatment, fillings, and dental prosthesis for which the patients were referred to the Department of Prosthodontics. The questionnaire was divided into three sections. Section A included demographic details, Section B included the knowledge and attitude of patients regarding dental treatment, and Section C included the treatment rendered and satisfaction level of the patient. They were asked to rate their level of satisfaction after receiving treatment as highly satisfied (I), satisfied (II), and not satisfied (III). The data were analyzed using SPSS version 18 (SPSS Inc., Chicago IL, USA).which covered both descriptive and inferential statistics. Chi-square test was used to find statistical significance (P < 0.05) between variables. Spearman's correlation was employed to test the degree of the relation between the demographic variables and patient satisfaction and treatment response. A total sample of 474 participants was taken which were treated over a time period of 3 months. Out of the total sample, 61.2% (290) of them were males and remaining 38.8% (184) were females. 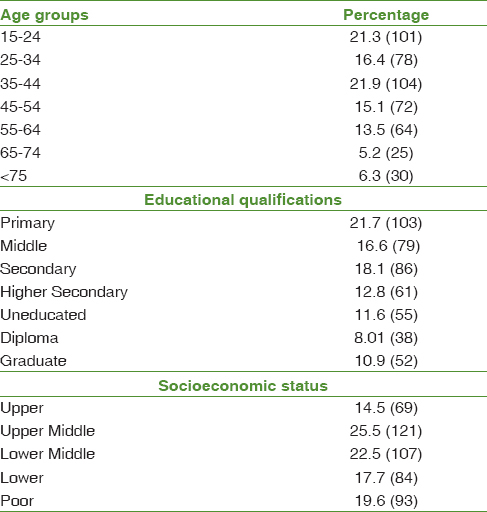 A demographic detail among the sample is described [Table 1]. It was found that majority of the participants cleaned their teeth regularly with toothbrush 91.6% (434) and toothpaste among 82.6% (391), yet the knowledge regarding the fluoridated pastes was found to be very less in only 25.2% (120) of the participants. About 70.4% (333) of the participants believed that forceful brushing makes teeth more clean and healthy. Almost all the participants had moderate knowledge of dental caries, yet 70% (331) of them believed that treating dental caries is painful. About 65.4% (310) of the participants thought that extraction is the only possible treatment for painful teeth and 47.6% (226) of them believed that home remedy taking painkillers can treat pain and no further treatment is required after that. It was astonishing to find that today also, 55.4% (262) of the participants had never heard about randomized controlled trial (RCT), and among the remaining, 63.2% (299) believed that extraction is the only treatment for carious tooth. Out of the treatment done, scaling was found to be in 32.2% (153), filling in 22.5% (107), extraction among 20.6% (98), root canal treatment among 17.08% (81), prosthesis in 2.7% (13), and multiple treatment among 4.6% (22) of the individuals. Scaling (50.9%) and RCT (24.03%) were the most common treatment rendered in the age group of 35–44 years, while extraction [(64%) 65-74 years] and [(86.6%) >75 years] was the most common treatment among >65 years participants. Age-wise distribution of treatment rendered is described in [Figure 1] [ P ≤ 0.04]. Age-wise distribution of treatment rendered is described in [Figure 1] (P ≤ 0.04). The participants, who underwent dental treatment, were asked about their satisfaction with the quality of service provided to them. It was found that 80.4% of the participants were satisfied with the services rendered to them and agreed to visit the dental college for any future treatment and will also recommend others for a regular dental checkups and treatment [Table 2]. Statistical significance was also found (P < 0.05) between the quality of service and the willingness for a future visit to dental college. A positive correlation was found (r = 0.36) with statistical significance (P < 0.01) between participants willing for treatment and the likelihood of recommending others for dental treatment at the dental college. To provide quality health care, one of the important element of quality is the satisfaction with the services provided to the patients. There are two different types of dimensions for the patient's perception regarding dental treatment. First is the people who had never visited a dental clinic and did not want to visit for any dental treatment. This may be due to the fact that many people consider oral signs and symptoms to be less important than indications of general illness and have false beliefs toward oral treatments. As a result, they may avoid or postpone the needed care, thus exacerbating the problem. Other reasons may be lack of awareness or fear of pain. On the other hand, there is another group of people who were treated, but they do not want to go for treatment again, and this may be because of dissatisfaction with the services or skills of the dentist. This dissatisfaction and discomfort on the part of the patients cannot only affect the opinion but also create a resistance to referrals. In this study, the educated participants were satisfied more than the uneducated. This may be due to their knowledge, understandability, and responses to the treatment. Lack of education along with traditional beliefs and sociocultural factors leads to the development of false perceptions. Age played a considerable role, as high percentage of older individuals in the study required dental treatment but was very hard to make them understand. This may be due to their lack of intellectual capabilities and had beliefs in pessimistic perceptions toward oral health. A patient's attitude can be changed by understanding their individual needs, and a dentist needs to behave appropriately and adopt the right attitude., It was found that a poor attitude on the part of the dentist, during the treatment or during interactions with patients, can make the patient feel less satisfied and also determine patient's attitude. This is in accordance with other studies which indicated that the doctor's explanation of illness and treatment options to the patient received a low evaluation., Providing the patient with further explanation of their treatment options should be highlighted by the dentist to achieve high level of satisfaction with dental service. Majority of the patient were satisfied with the quality of care they received, some patient have complained, and some patient had felt like complaining. The reason for complaint should be sought. Dentist should not only be focused on finishing the treatment as fast as possible but also concentrate on explanation of the treatment as well as the treatment options to patient's satisfaction. Satisfaction levels are based on the study results and cannot be considered conclusive because of the limited sample size. Emotional stress, cost-effectiveness attitude of patients toward dental treatment, patients' education, and communication can be some of the factors which can lead to dissatisfaction and needs further evaluation. The study acts as a guide for the dentists to ensure patient satisfaction as an indicator for the quality of dental services, being part of the total quality management policy. The participants in the study had sufficient knowledge, fair attitude, and practice regarding oral health. Proper information given to the populations at large through dental check-up camps, mouth to mouth awareness, or by media will help them to change their attitude regarding dental treatment. Based on these findings, the establishment of a community-based oral health education program is recommended. The authors want to thank all the study participants for their voluntary participation and motivating others to seek dental treatment. Dali M, Laleet R. A study on oral health knowledge, attitude and practice among population of Siswanijahadavdc in Biratnagar city, Nepal – A questionnaire survey. Asian Pac J Health Sci 2014;1:51-6. Anup N, Biswas G, Shravani G, Sontakke P, Kumawat H, Jain P. Knowledge, attitude and practice of dental treatment among medical officers at PHC's of Amer and Jamwaramgarh Tehsil, Jaipur, Rajasthan – A pilot study. J Dent Med Sci 2014;13:115-21. World Health Organization. Oral Health Surveys: Basic Method. 4th ed. Geneva, Switzerland: World Health Organization; 1997. Raftopoulos V. Grounded theory for patients' satisfaction with quality of hospital care. J Web ICUS Nurs 2005;22:1-15. Available from: http://www.nursing.gr/grounded.pdf. [Last accessed on 2015 Nov 20]. Kotler P. Marketing Management. 11th ed. Upper Saddle River, NJ: Prentice Hall; 2003. p. 61. Keegan O, McDarby V, Tansey A, McGee H. Community Involvement in A/E Satisfaction Survey; 2003. Available from: http://www.lenus.ie/hse/bitstream/10147/43559/1/3498.pdf. [Last accessed on 2015 Nov 20]. Ramsay J, Campbell JL, Schroter S, Green J, Roland M. The General Practice Assessment Survey (GPAS): Tests of data quality and measurement properties. Fam Pract 2000;17:372-9. Hart JT. The inverse care law. Lancet 1971;1:405-12. Arrejaie AS, Khan SQ. 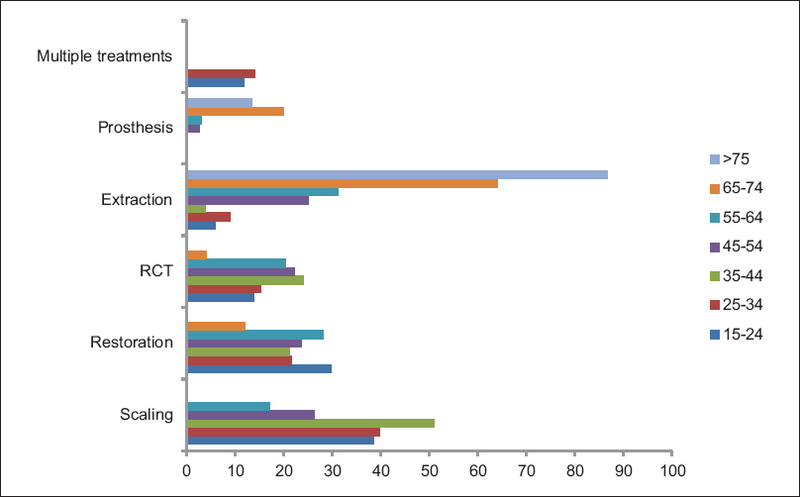 Patients' attitude towards clinical care at academic institutions. Int J Integr Med 2013;1:25. Anctil B, Winters M. Linking customer judgements with process measures to improve access to ambulatory care. Jt Comm J Qual Improv 1996;22:245-57. Gürdal P, Cankaya H, Onem E, Dinçer S, Yílmaz T. Factors of patient satisfaction/dissatisfaction in a dental faculty outpatient clinic in Turkey. Community Dent Oral Epidemiol 2000;28:461-9. Kumar S, Mythri H, Kashinath KR. A clinical perspective of myths about oral health a hospital based survey. Univ J Pharm 2014;3:35-7. Gao X, Hamzah SH, Yiu CK, McGrath C, King NM. Dental fear and anxiety in children and adolescents: Qualitative study using YouTube. J Med Internet Res 2013;15:e29. Drain M, Kaldenberg D. Building patient loyalty and trust: The role of patient satisfaction. Group Pract J 1999;48:32-5. Nelson EC, Batalden PB, Huber TP, Mohr JJ, Godfrey MM, Headrick LA, et al. Microsystems in health care: Part 1. Learning from high-performing front-line clinical units. Jt Comm J Qual Improv 2002;28:472-93. DiMatteo MR, Prince LM, Taranta A. Patient's perceptions of physician's behavior: Determinants of patient commitment to the therapeutic relationship. J Community Health 1979;4:280-90.
vom Eigen KA, Delbanco TL, Phillips RS. Perceptions of quality of care and the decision to leave a practice. Am J Med Qual 1998;13:181-7. Zastowny TR, Roghmann KJ, Hengst A. Satisfaction with medical care: Replications and theoretic reevaluation. Med Care 1983;21:294-322. Sheiham A. Oral health, general health and quality of life. Bull World Health Organ 2005;83:644. Epstein RM. Mindful practice. JAMA 1999;282:833-9. Zinn WM. Doctors have feelings too. JAMA 1988;259:3296-8. Al-Mudaf BA, Moussa MA, Al-Terky MA, Al-Dakhil GD, El-Farargy AE, Al-Ouzairi SS, et al. Patient satisfaction with three dental speciality services: A centre-based study. Med Princ Pract 2003;12:39-43. Jackson JL, Kroenke K. Difficult patient encounters in the ambulatory clinic: Clinical predictors and outcomes. Arch Intern Med 1999;159:1069-75. Karydis A, Komboli-Kodovazeniti M, Hatzigeorgiou D, Panis V. Expectations and perceptions of Greek patients regarding the quality of dental health care. Int J Qual Health Care 2001;13:409-16.